On the streets of Central Detroit, a sense of place -- and possibility -- isn't always easy to come by. Neighborhood residents had no shortage of suggestions for ways to make this a better place. PPS knew that engaging the neighborhood in Placemaking would take more than just a workshop. 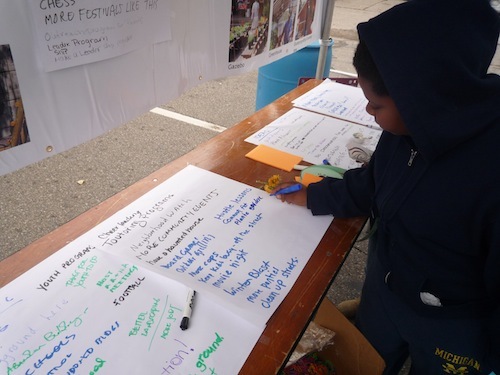 So, with the support of the Kresge Foundation and working with the Central Detroit Christian Community Development Corporation (CDC), we decided to do a fun harvest festival that would demonstrate the neighborhood's potential. It would also be a way to get more Placemaking ideas from people who would be unlikely to show up a community meeting. And it worked. 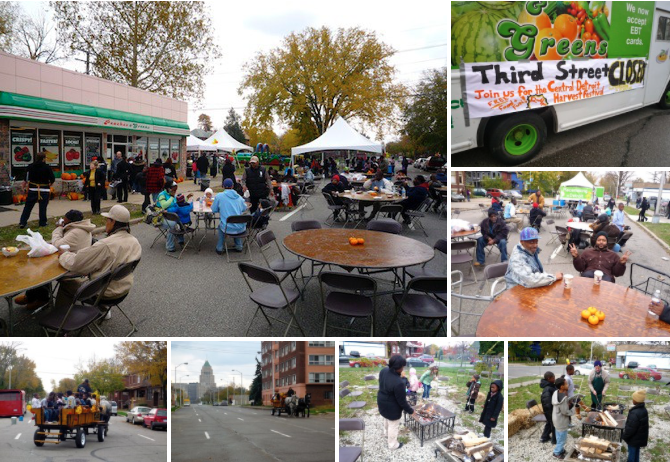 On October 29, PPS was thrilled to be part of a very successful harvest festival outside the wonderful neighborhood produce market Peaches & Greens, which is celebrating its third anniversary. Although flanked by vacant lots, Peaches & Greens proved to be the right spot for the festival -- and the event showed how this could evolve into an even better place for the neighborhood to come together. This is a neighborhood with a lot of basic needs. Many residents are out of work. Many don't own cars, and the public transit system is utterly inadequate. Safety and security are a major concern -- the city can't even keep up with repairing broken streetlights. A lot of houses are abandoned and occupied by squatters. The term "food desert" has become well known, but this part of Detroit might also be called a "place desert." As the city's population has shrunk, neighborhoods like Central Detroit have lost not just people and homes, but places to come together. Still, a lot of assets remain, including some beautiful housing stock and strong community organizations such as CDC. Importantly, the city has designated this as one of the communities where resources are going to be focused in the future. The tough conditions faced by local people made the response to the festival even more heartening. People were ready to jump right in and become part of something more meaningful. They provided a lot of practical ideas for activities could be taking place around Peaches & Greens on a more regular basis. One thing we heard from a lot of local residents was that they are eager to see more community-building events in the neighborhood. Lots of people stuck around after the festival was over to help clean up. One of the day's high points came when we announced the winner of a bicycle we were able to raffle off. The woman who won it told us that she wasn't going to keep it herself -- she was going to give it to her grandson, who just turned 18, so that he could look for a job. This is just a pilot for what we hope will be many more events in the neighborhood, along with some "Lighter, Quicker, Cheaper" improvements that will make people's lives better in the short term. Big thanks to our partners at CDC and Kresge for making it possible.